I am pleased to say that my painting ‘East End Crossing’ has been selected for The New English Art Club’s Annual Open Exhibition at the Mall Galleries in Central London between 16 and 25 June 2016. London’s East End is, and always has been in a state of flux. Nothing remains the same for long, and this instability gives rise to contrasts. It is the tension between the contrast that I have tried to capture in my painting. Namely, the lighter, upper levels of East End life, and a darker underworld just beneath the surface. 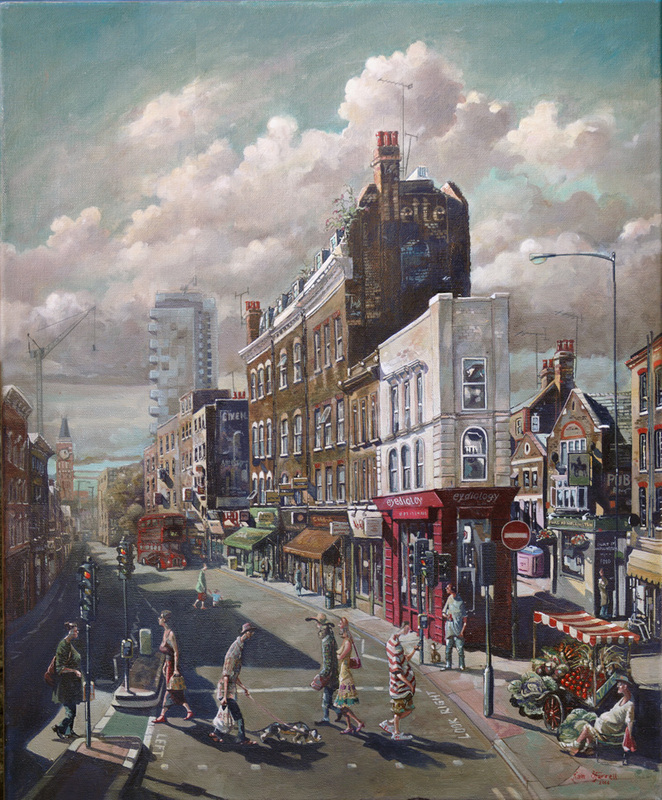 The painting is based on a crossing on Commercial Street in Spitalfields. From the 16th to the 25th June 2016, 10am to 5pm daily (closes 1pm on final day). £3, £2.50 Concessions, Free to Friends of Mall Galleries and Under 18s. 50% off to National Art Pass holders. I have used that crossing so many times in the last three years – I knew it straight away! It heads towards the aptly name Fashion Street where a fashion school is located that I sometimes teach at. The pub is good (The Wellington)! Great work Liam. Love how you capture dear old England in your work and wishing you continued success with your art. Many thanks to you Dave. i will do my best. Amazing painting and great collection of London stories. Many thanks Ghenadie, Every street has something to tell. As a painter , if you stand there long enough someone will stop by and chat about it all. thats a beautiful painting, must of taken many hours to work on ! Yes it was really tricky for me as I was trying out new techniques for the first time. Thankfully it all worked out. I love this painting, you really capture the energy of the street! And you got into a show, well done you. many thanks and yes, most pleased about the show.